It’s a hot summer night as we enter the Coffee Shop of Defence Club. Set amidst, a large lush green lawn and overlooking the tennis courts, it’s a welcome addition to the eateries of the Defence Club. The Coffee Shop’s decor is warm, comfortable and elegant. The cafe is nicely lit; the lights bounce off the wooden floor and illuminate everything in a soft glow. It’s crowded and people, mostly families sit either around small glass tables with wrought iron seats or the couches set in the middle of the place. The coffee bar is housed in a large cabinet and trained baristas prepare a variety of coffee drinks, made from gourmet South African beans. The cold coffee is not extremely sweet, its cold enough and the tongue can feel a bit of bitterness — the flavour is just right. 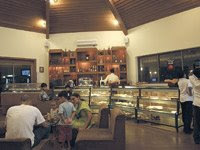 The Coffee Shop also hosts an assortment — like all other cafes — cakes, brownies, cookies, tarts and hand-made ice cream. What it does have and others don’t, is a Middle Eastern sweet (which looks like a carrot cake) known as a ‘basboosa.’ It’s quite popular and should be tasted, at least once.